Hello from Middle Earth ! Been a wee while since my last completed build here, even longer since my last SAR project. 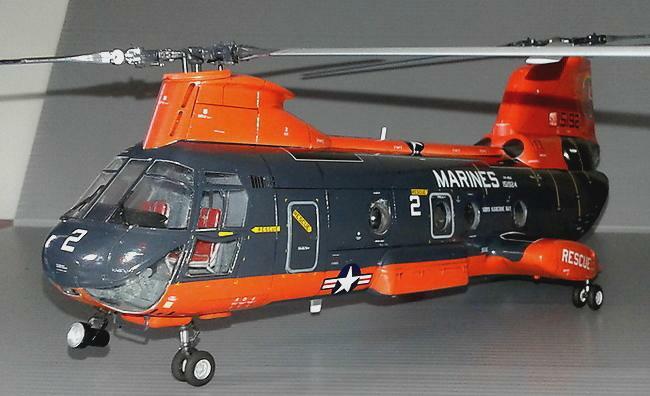 So here is, fresh from my bench, Academy’s excellent HH-46 Sea Knight complete with kit decals for a machine from SOMS Kaneohe Bay in the mid 1980’s. 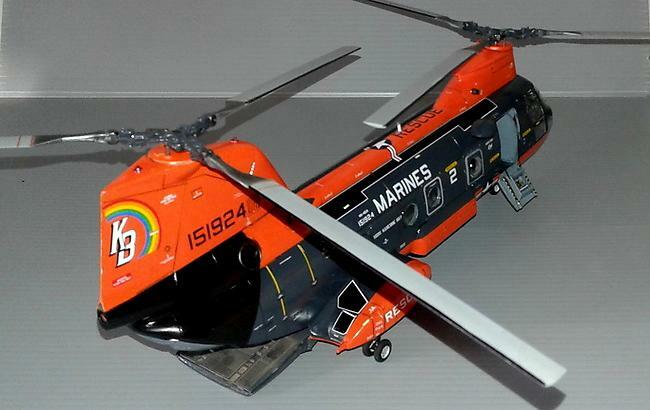 If you’ve read any of my ridiculous ramblings before you’ll know that Search & Rescue, particularly Maritime has been my career for twenty years and until relatively recently I’ve not done much in the way of builds that celebrate that. I bought this kit more years ago than I can honestly remember and finally decided to have-at-it a couple of months ago. It goes together really easily, there’s nothing there to trip you up and the decals are superb and respond very well if you treat them gently and carefully (resilient they most definitely are not). Straight from the box with the sole exception of an Eduard ‘Zoom’ set and painted with Xtracolour enamels, I absolutely loved this build. Not too much else to say, as ever I’m happy for folks to hurl abuse, ask any questions or make any comments. Thanks for taking the time to look. 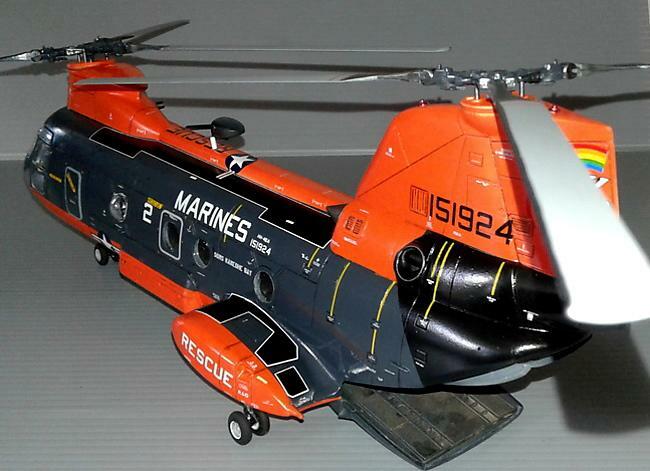 Impressive looking model. Very well dressed aesthetically. 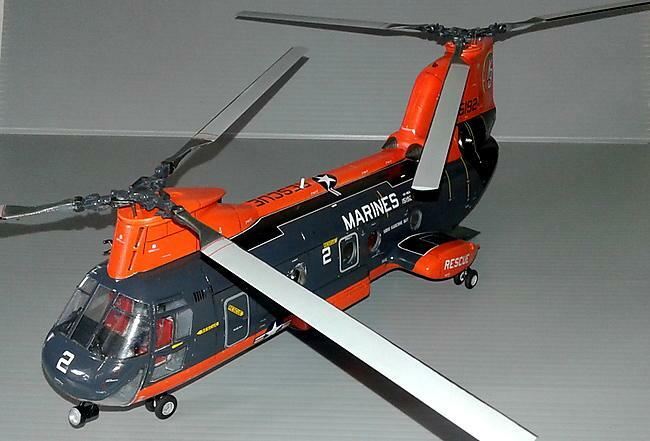 Are you going to do more builds, like a diorama, to celebrate you 20 year career? 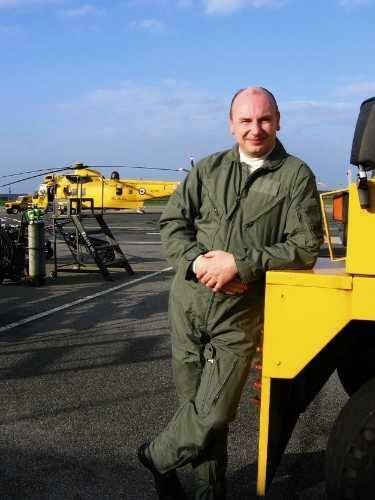 No Peter, I’ll just build the occasional SAR machine in amongst my race cars and aircraft projects ! I really like this, Ian. The whole package – build quality, paintwork, and overall ‘feel’ are all superb. Looks stunning and I get a sense it must have a real ‘presence’ in the flesh (and take up a bit of shelf space, also). Take care, and watch out for those orcs. Beautiful model in a striking color scheme. These models keep “the past” living on. Good to read you are also a user of the Xtra Color. I am a frequent user of Xtra Color Enamels. Personally for me the best model paints available. Already more than 35 years. Completely agree – I do use acrylics, but my ‘go to’ paints are always Xtracolour & Humbrol enamels. Looks to me like rambling is a good thing given the subject matter,the colors and the excellent build. I can only concur with the masses, Ian.. two thumbs up! Love every thing about this build. Awesome paint scheme..my favorite look for this subject matter. I had this kit years ago and sold it b/c needed money but wish I had it back to build like yours. Thank you all, Love the enthusiasm here at iM, and never take your positive comments for granted. 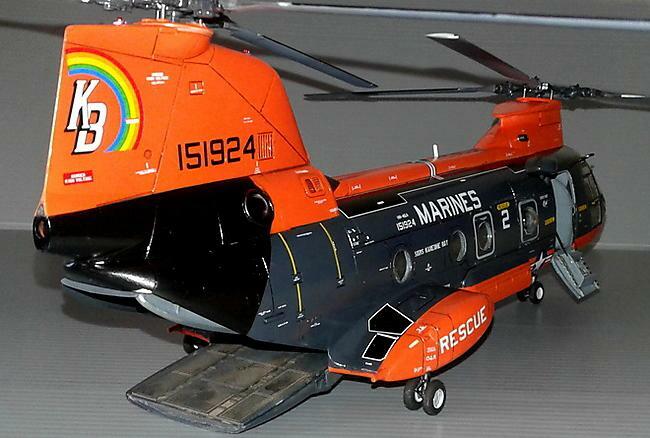 Not sure when or what the next SAR build might be, but I do have a Wessex, a Sea King and a Bell 47 that would all fit the idea. Next tho’…. a big, noisy, silver jet ! Ian, very well done and a very attractive scheme, I like it a lot ! Very nice, very realistic-looking result. Ian, that’s a great job you’ve done! The paint scheme is very unique. Beer is your / my friend, Jeff. 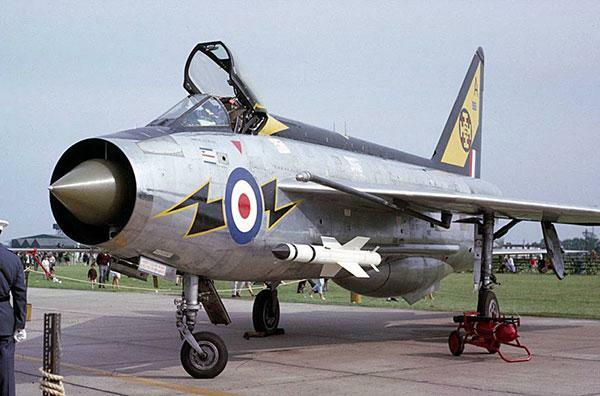 Actually I’m British, and most of my ‘war stories’ are from my RAF & HMCG time. Here in NZ it’s been pretty easy !! Lovely build mate! I really like the colours on it, very jazzy. Great build! Love the scheme and you finished her very nicely. Well done! My G-10 Erla Has Landed!